I love second-hand bookshops. Leafing through other people’s no longer needed and discarded books that you’ve discovered on dusty shelves in a quirky retail environment is one of my guilty pleasures. Guilty, because I have so many books still to read. Yet a pleasure because I don’t think you can ever have too many books. And when your purchases also help Amnesty International, as they do from my local second-hand bookstore in Newcastle then, all the better. * Please note this post includes an affiliate link. I recently found a paperback copy of Bill Bryson’s “A Short History of Everything” in a secondhand bookstore for just £2. I know a total bargain. If I’m honest I was thinking more about the boys when I bought it but I started reading it first, keen to refresh my science knowledge ahead of my eldest starting secondary school and little did I know how much of a page-turner it would be. I took it on holiday, to the beach, read it in the garden, in the car and on public transport. I hardly stopped reading it until I’d finished. It’s a fairly hefty book with 574 pages and 30 chapters and it also has a very large reference section. 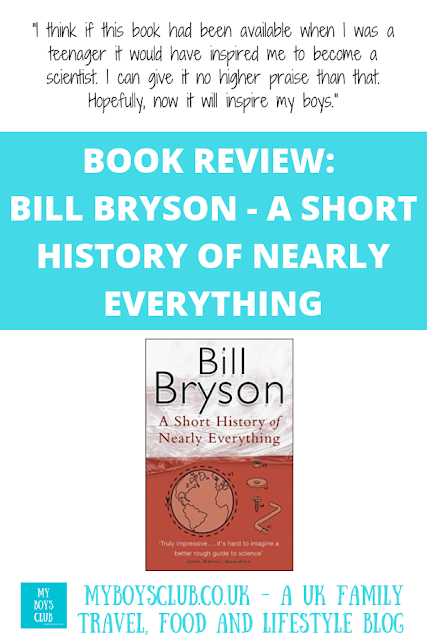 It covers a range of topics from the Big Bang to now and virtually everything in between. All of the obvious topics and scientists are included but so much more too. I have a chemistry qualification from school but this book has so much in it and has taught me so much more than I ever learnt at school - although I too was amazed the first time I burnt magnesium in the lab. And as for physics and biology at school, all I remember is how to wire a plug and how to dissect a rat. This is the ‘text’ book I wished I’d had and I’m really hoping my boys read it and love it as much as me. 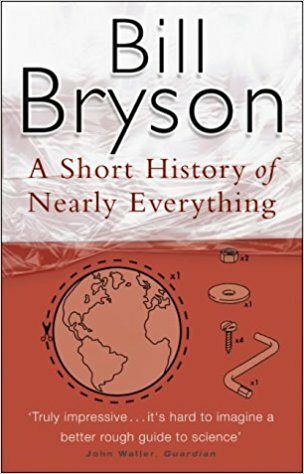 Yes, it’s a book about science but it’s written in true Bryson style. With warmth and humour (yes I’m English and we do love talking about the weather) it tells a story, not just delivering facts, and does so in such a memorable way. I’ll never now forget that the numbers of the elements in the Periodic Table correspond to the number of atoms in each molecule. Atoms themselves are comprised of protons, neutrons and electrons. And that when you feel the warmth of the sun on your back it’s actually excited atoms energised by the sunlight. Plus we never actually come into contact with anything - our own electrons repel electrons of other masses, as they do us. And I’ll never think of water, as just water again or bacteria as bacteria. This really is a book that not only confirms everything you thought you already knew but also totally blows your mind. 1. Not everyone gets the recognition they deserve. 2. Misreporting by the media is nothing new. Sending a golfing correspondent to cover a new scientific theory is one way of making sure it doesn’t get the coverage it deserves. 3. So much of what we now know is down to the passion, commitment and belief of just one person or a handful of people who had the tenacity, dogged determination and means to test out their theories even when derided or sidelined by prominent others at the time. 4. So few women. I know it shouldn’t be a surprise but when history is condensed like this it really stands out. I wrote about ‘herstory’ earlier this year on International Women’s Day. 5. How interesting geology is. It covers so much interesting activity on earth. Who knew rocks could be so exciting. 6. Not everyone is a good person. The older I get the harder it is to keep believing that everyone is basically good. Throughout history, there have been quarrels, disagreements, cheating, double-crossing and so many transgressions. 7. But the most important learning for me is that there is so much we don’t know and doing understands and it’s ok to say that. Whether you find a second-hand copy or buy a new copy and here is an affiliate link to buy from Amazon then this is really a book worth getting your hands on, whether you have kids or not. I totally loved it and now that I’ve finished it I’m convinced it’s what the writers on University Challenge use to write most of the questions. Can’t wait to watch the next episode to see I can beat my personal best, but I may need to re-read the book a few times first. I think if this book had been available when I was a teenager it would have inspired me to become a scientist. I can give it no higher praise than that. Hopefully, now it will inspire my boys. 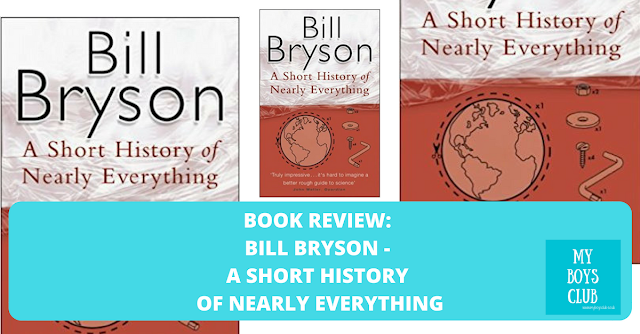 “Life is amazing and gratifying, perhaps even miraculous, but hardly impossible” so writes Bill Bryson, and his book is also amazing, educational, informative and also entertaining. What book has really surprised you? PS Have you read our review of Barter Books in Alnwick?